Earlier this year, on discovering how long I’d worked here, a visitor asked me what my favourite story or anecdote from over the years was. I was completely thrown – not only had nobody ever asked me that specific question before, but how on earth was I to pick just one thing? But the question made me ponder, and reminisce a bit. 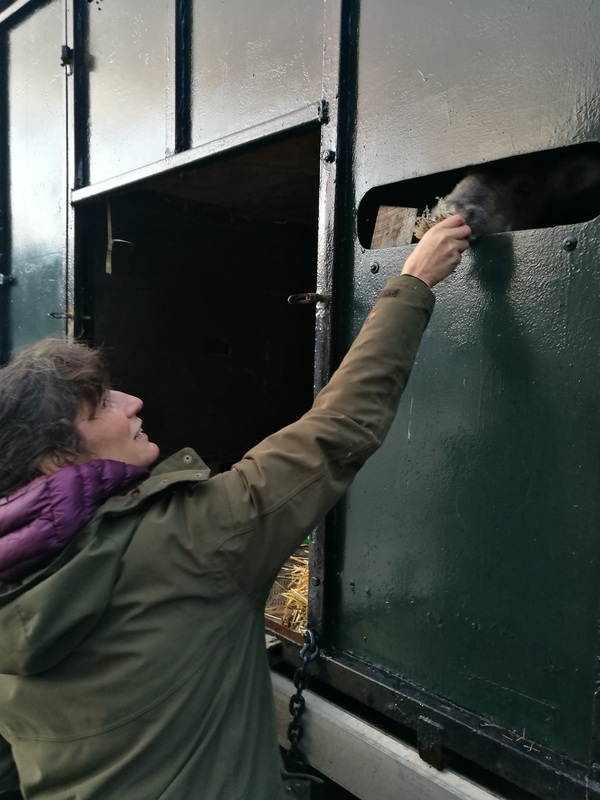 Impossible to pick a single favourite moment, but there have been many, many stand out moments – and like for any job with animals, for both good and bad reasons. So I thought I’d tell you one of them, and will maybe write more blogs with further stories at a later date. At the time when the question was actually asked of me, I went a bit blank, and despite a million different stories I could have told, suddenly the only one I could think of was a little moment from Christmas tour, several years back. 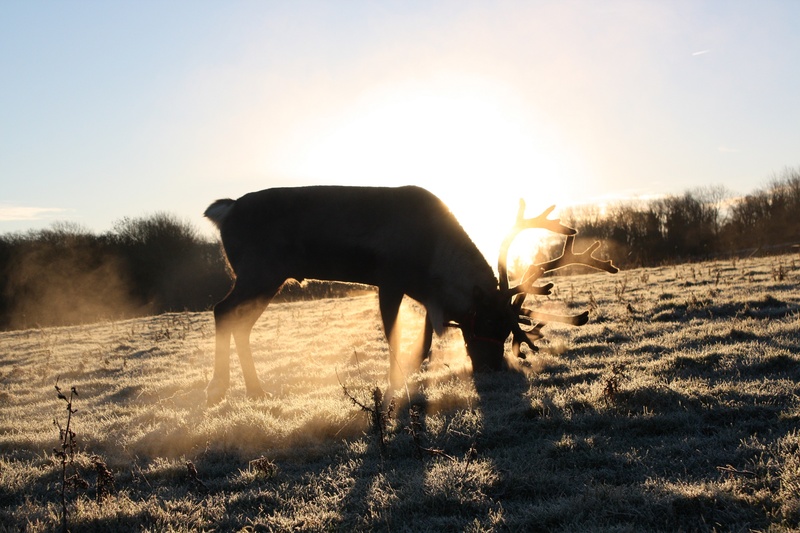 I was on tour with Mel right down south and doing a ‘reindeer only’ event in Exeter. 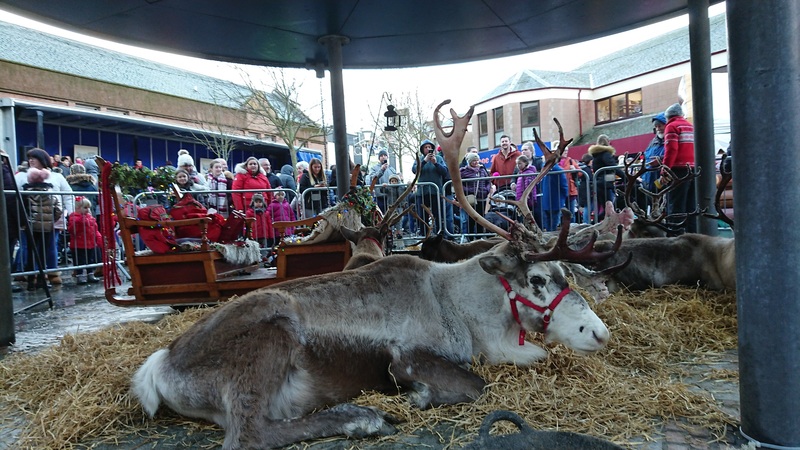 This differs from our normal events with the sleigh and parade etc, as it is just reindeer in a display pen for 2 or 3 hours, with us herders there to chat to people in the crowd. 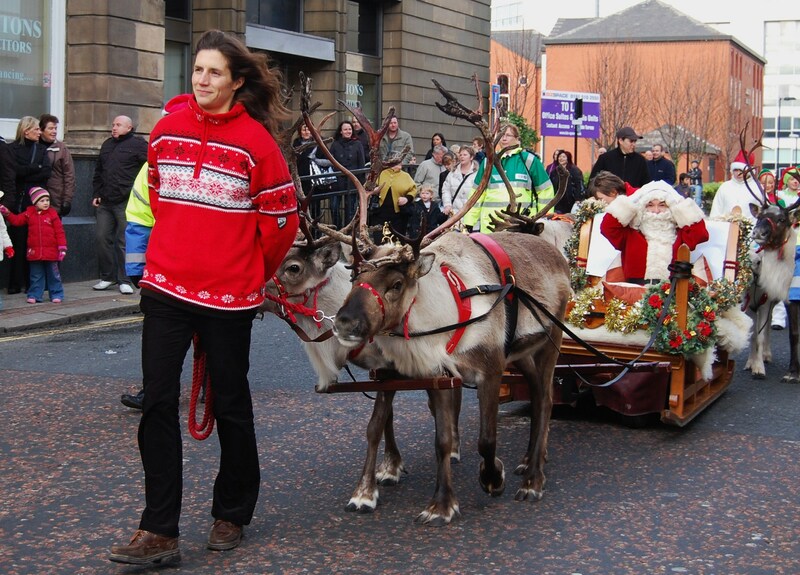 Much less work for both us and the reindeer compared to a parade! It was a horrible day, absolutely pouring, so I can’t say either Mel or I were particularly enamoured of the idea of standing getting utterly drenched for hours, the sort of day where you know you’re going to get soaked to your underwear and the prospect of dry pants was a long way away (Christmas tour ain’t as glamorous as it sometimes sounds) – at least the reindeer have built in waterproof coats far more effective than any human clothing. 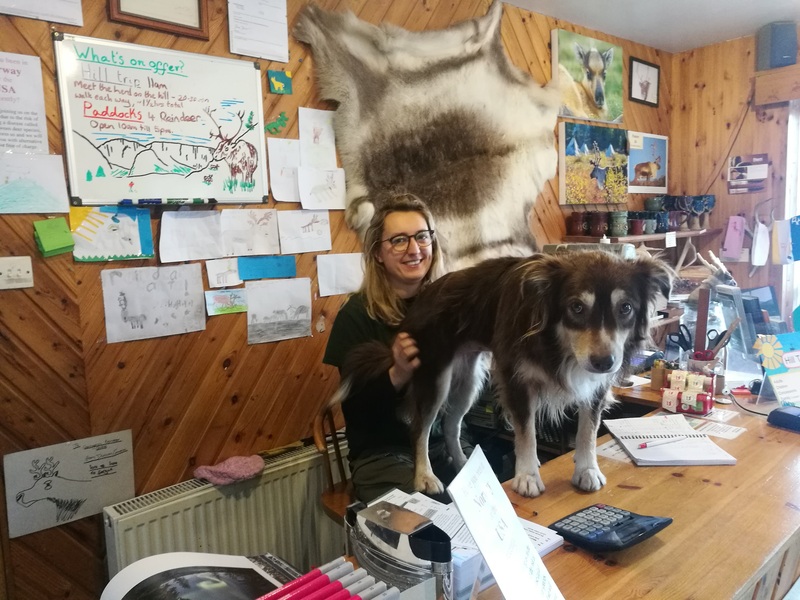 We got the pen ready; straw spread out, feed and water in bowls, signage up, and then returned to the lorry to fetch the reindeer. 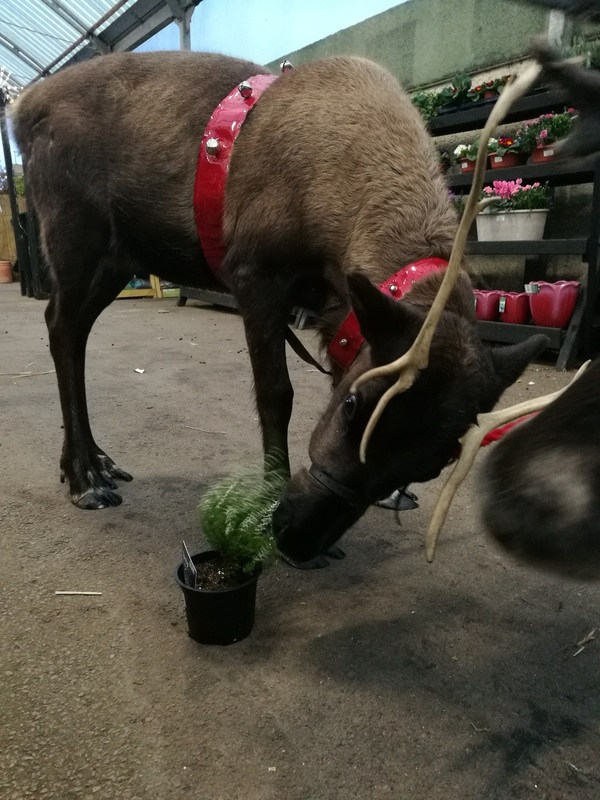 The route to the pen involved walking along the pavement and then through a covered shopping arcade to the pen itself – no problem at all and the reindeer are perfectly happy in such a situation as we make sure that all six stay close together in their mini herd. 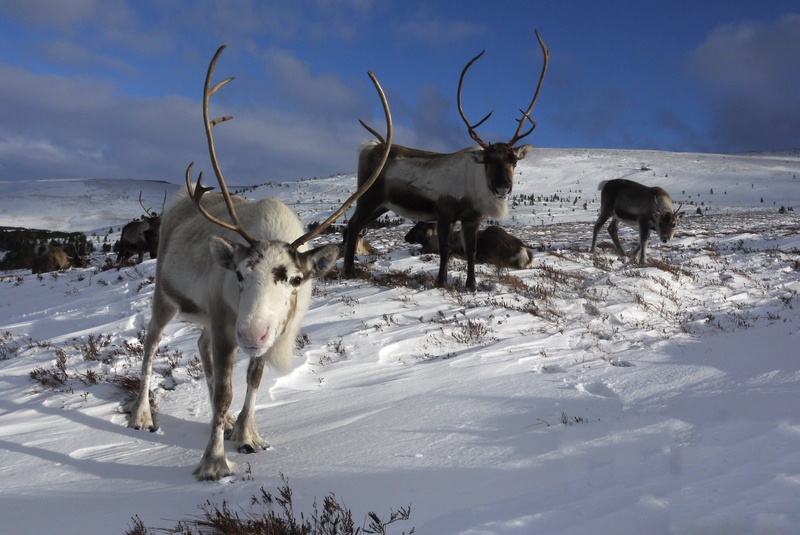 There’s safety in numbers if you’re a reindeer! 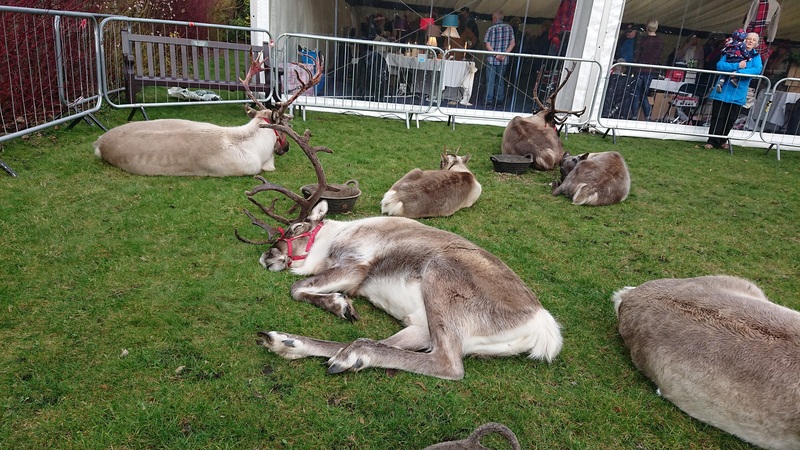 Just at the entrance into the arcade we paused, in the pelting rain, for security to clear a route through for us and the reindeer stood gazing around in interest at their surroundings – or more realistically, in hindsight, wondering where their pen and their lunch was. 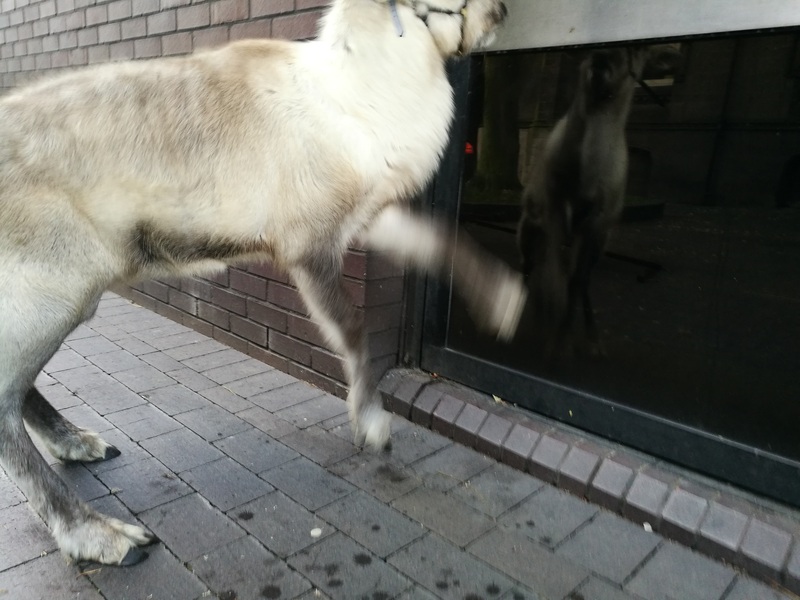 We were right outside a Costa coffee shop which had window seating, full of warm cosy people inside sipping nice hot drinks and oblivious to the world outside, until suddenly 6 reindeer appeared on the pavement, literally just feet away from them. 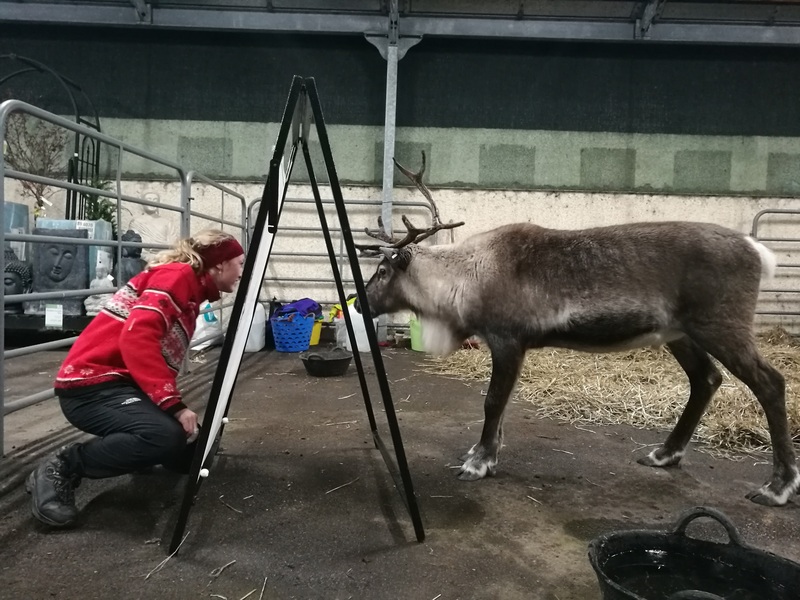 We had big male reindeer Puddock as our of our team members (I can’t remember the others), and he put his nose right to the glass and breathed out, leaving huge steamed up patches. I watched a lady inside slowly put her hand up to the glass and put it flat against it, Puddock’s nose a centimetre away the other side. A few seconds passed and then we moved on, and the moment was gone. 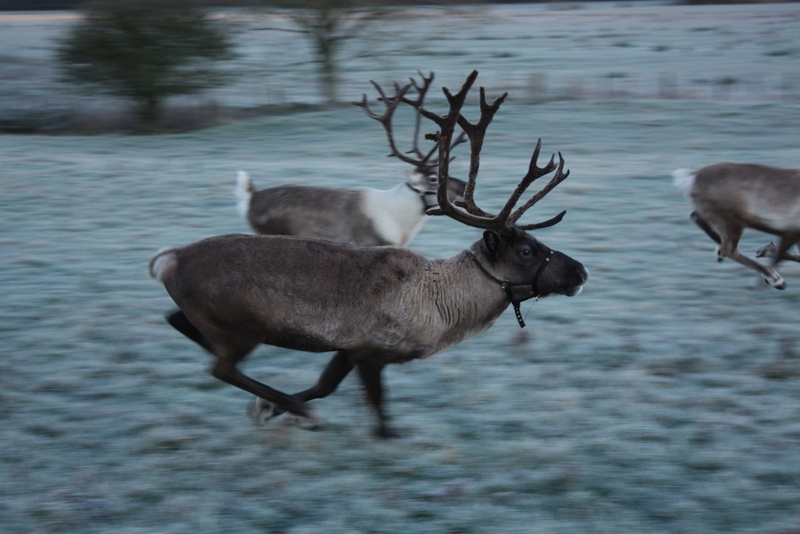 Reindeer exercising while at a ‘base’, away on tour. Good stretch of the legs required! And that was it. In real time just a fleeting moment, but one I have always remembered, and I often wonder too about the lady the other side of the window, and whether she still tells the story of the time she was having a coffee in Exeter and somewhat miraculously a reindeer appeared outside the window and then vanished once again. 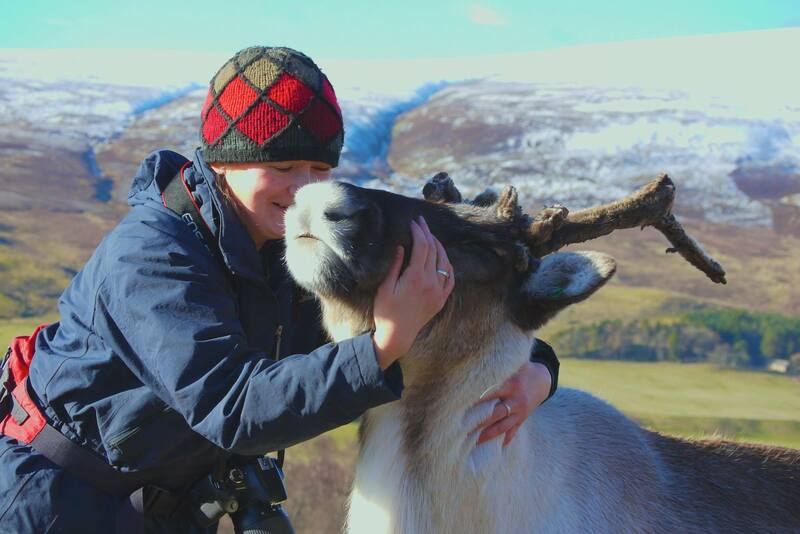 Years later I remember nothing about the actual reindeer event other than that little moment en route to the pen (and the fact that the herders at every single event across the country that day got completely soaked too apart from, ironically, at Fort William – normally one of the wettest places in the country). 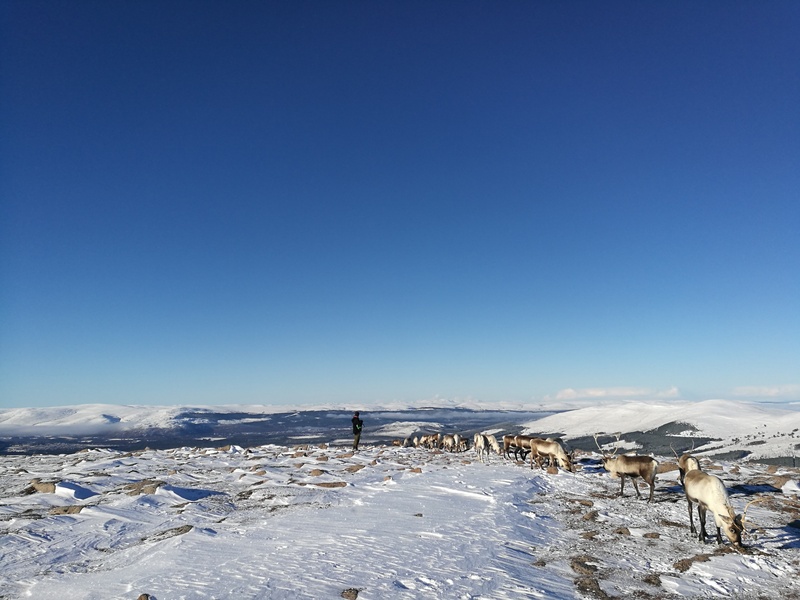 In my head I debated telling the visitor on the Hill Trip about this memory, but standing outside a Costa on a wet day in Exeter, of all places, seemed so at odds with our current situation way out on the mountainside high up on the Cairngorms, on a beautiful winter’s day, surrounded by reindeer roaming freely in their natural habitat, that it didn’t seem worth the effort of explaining it all, and it wouldn’t have been the sort of the story the visitor was expecting anyway. 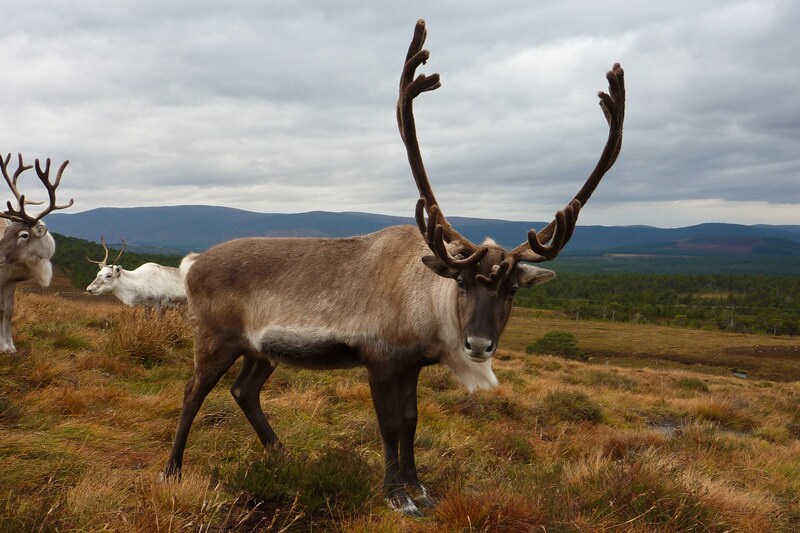 But it’s a memory for me none the less and as Puddock has been one of my very favourite reindeer over the years but is now retired from Christmas tour, it’s a particularly poignant one. We recently watched the BBC series Dynasties, narrated by David Attenborough, which looked at matriarchs in different species of animal. There are occasional females in our herd who are extremely successful mothers, and I thought it would be interesting to have a look at some of these family lines, starting with a gorgeous big female who was named Haze. 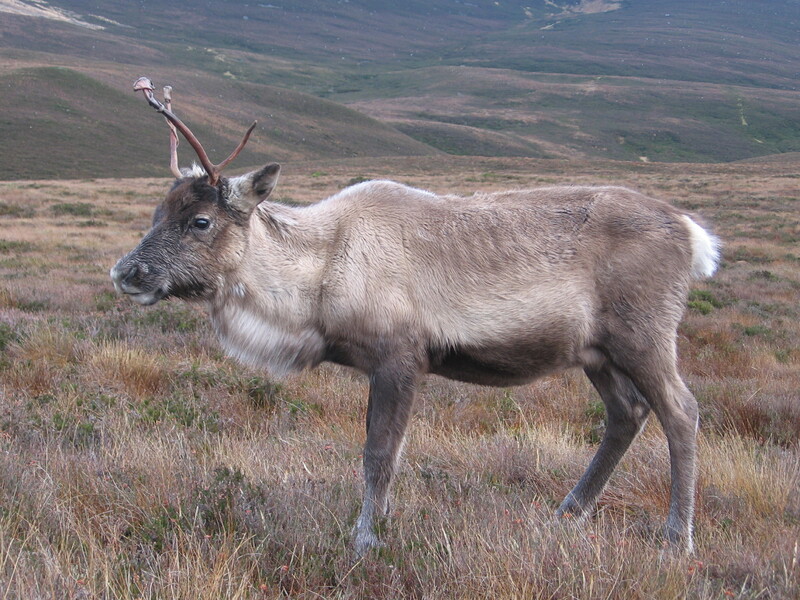 Haze was born in 2002 and grew to be a big, solid female who had distinctive large bold antlers – not fancy but quite thick for a female. Over the course of her life she reared six calves: Santana, Gazelle, Caddis, Wiggins, Camembert and Fyrish – four females and two males. She was a relaxed mum and was quite happy to let us humans come up when she’d just calved, give her some food and check the calf over. 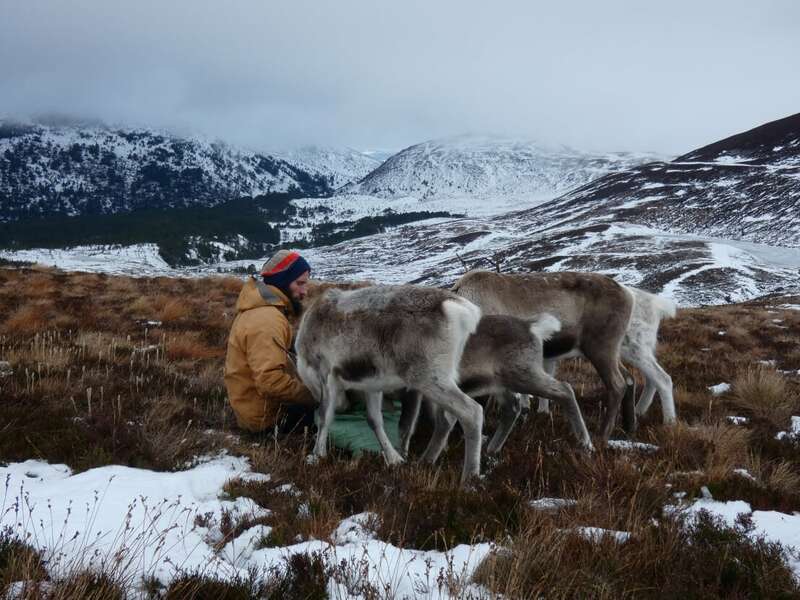 One of first reindeer calvings I attended on my own as a new herder was when she gave birth to Camembert, and I remember her being completely at ease, putting up with my inexperienced fumblings as I handled the calf briefly to spray its navel and check it had the requisite number of legs. 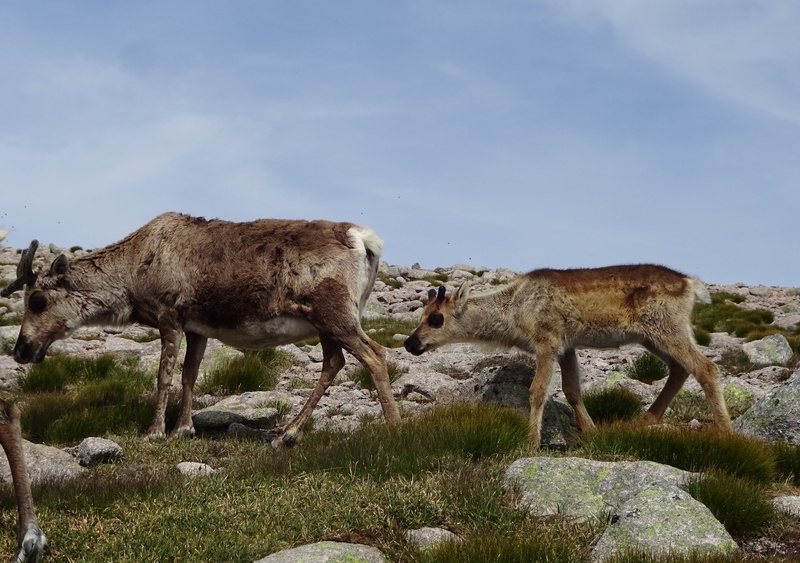 Haze passed on her large solid build to her offspring, most notably to Gazelle, Caddis and Fyrish, who are all quite chunky. 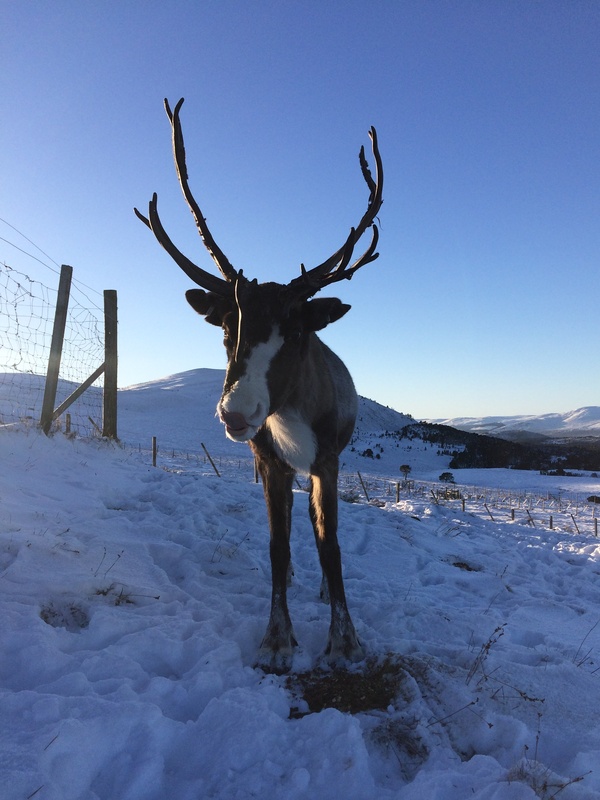 Caddis is the stand out mother from the next generation, consistently rearing one of the largest calves each year: Mozzarella, Lairig, Viking, Christie and Sherlock. 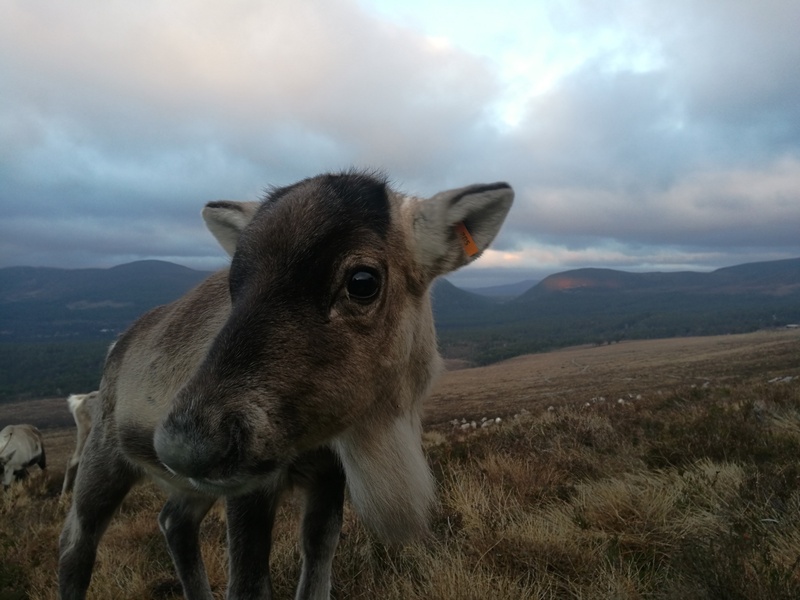 Her latest calf, Sherlock, is a real beast of a reindeer, already acting like a bull by 5 months old… Caddis also manages to pull off a huge set of antlers each year, despite the energy put into her new calf – what an incredible reindeer! 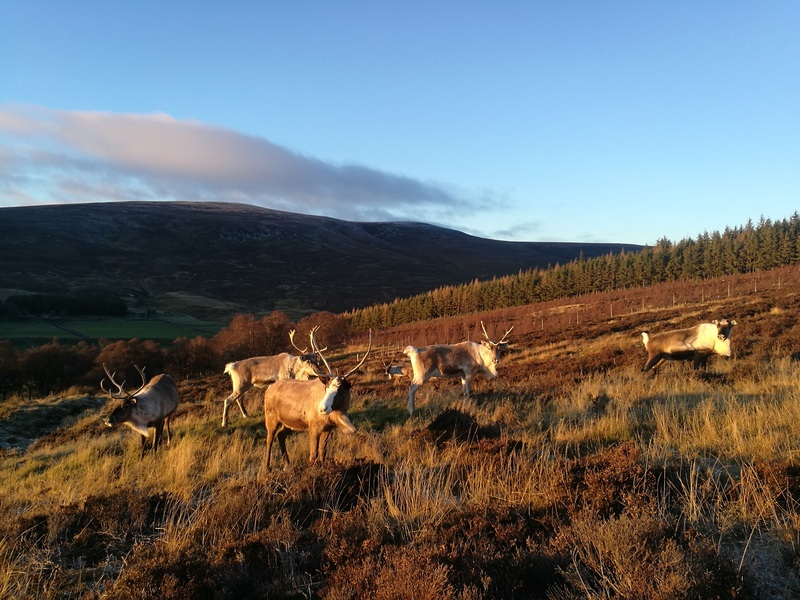 Gazelle has reared some lovely male calves, including Aztec and Burns, and whilst Camembert is younger and has only had one calf so far, Celt, he is one of the largest of his year group. He was a special one for me, as I found him as a newborn – the first calf I had found whose mother I had also been the first to find when they themselves were born – I felt like a proud granny…! Haze died in 2016 at the ripe old age of nearly 14, but her family line is continued – to date she has been grandmother to 10 youngsters, and last autumn we chose her son Fyrish as one of our main breeding bulls, so come May there is the potential for the family to become even larger. 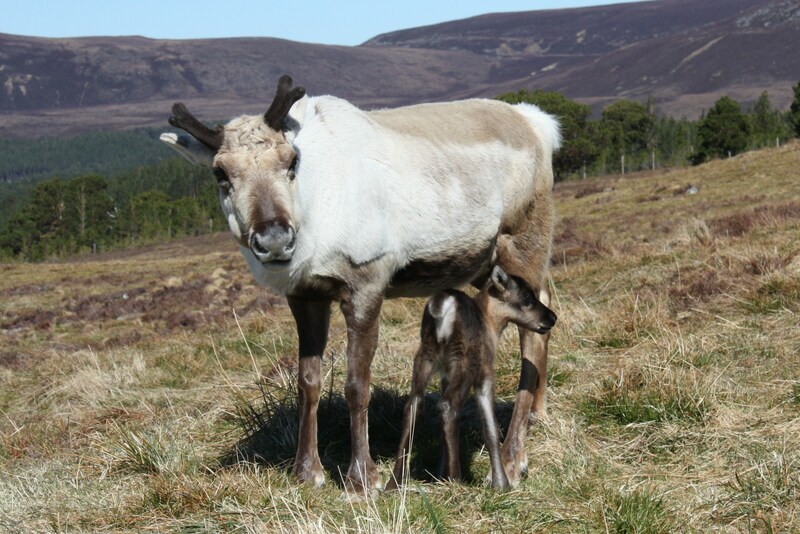 In May 2018 a male calf was born in our Reindeer Enclosure. His mother Ladybird was happy and attentive. He would later be called Bond. He and his mother left the enclosure a few weeks later bound for the tops of the hills and away from the heat of the coming summer. The pair was seen together a few times in the summer. 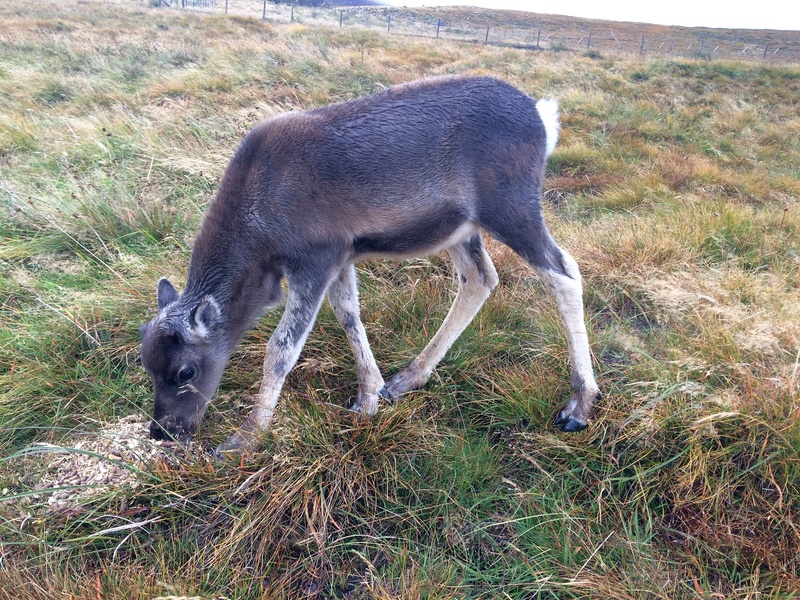 Bond was progressing fine and enjoying being a calf in the Cairngorms. 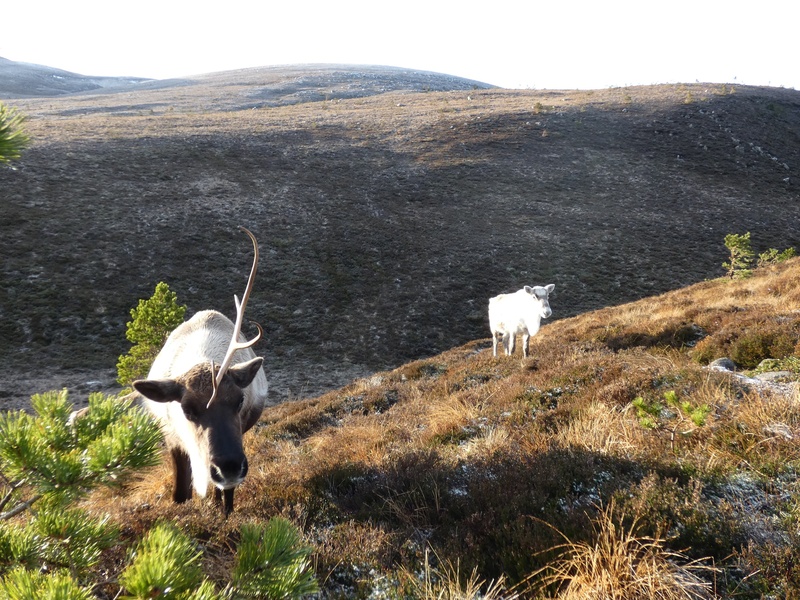 In the autumn, as always the reindeer came down from the tops of mountains to the lower pastures. 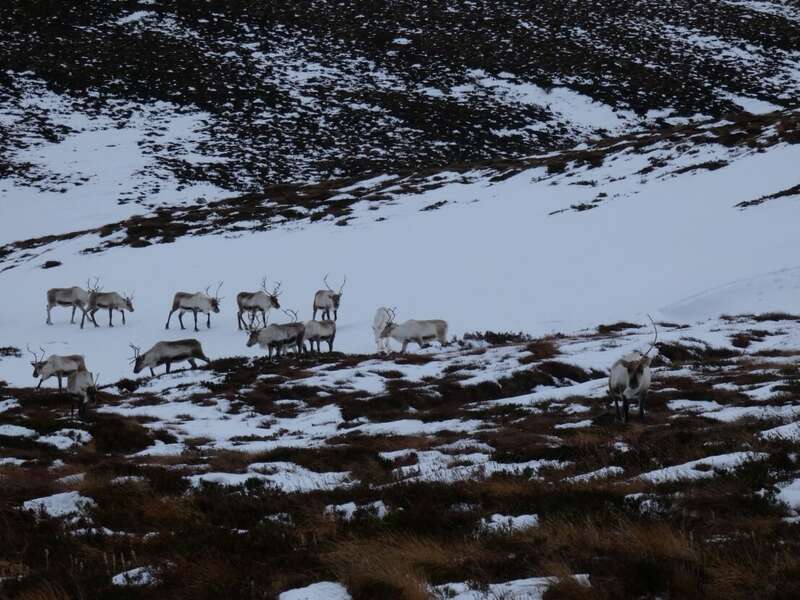 I was out looking for them one morning and spotted a large group up on the ski road. 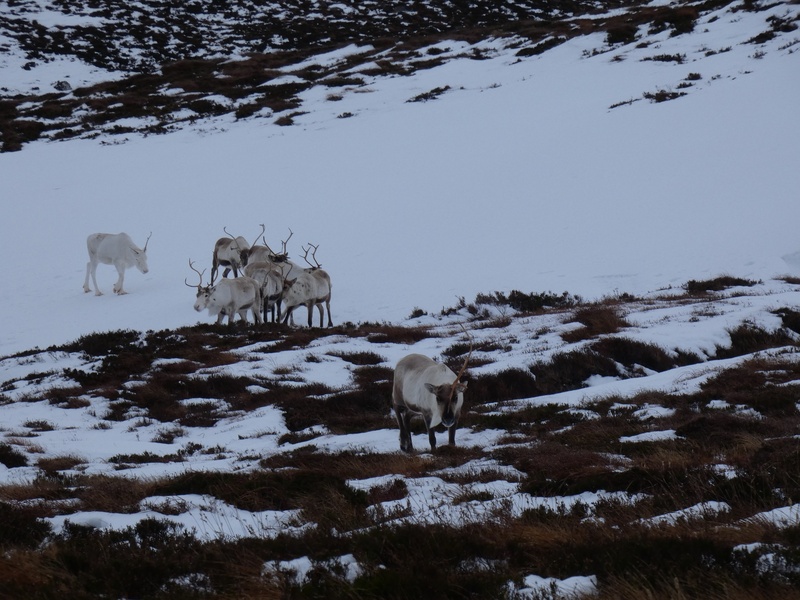 I led them down towards the Allt Mor and over Utsi’s Bridge keeping them interested all along with a bag of treats. This time of year we are always keen to see how the calves have got on so I was checking the group for any calves. I spied just one in this group, very small and without any antlers. 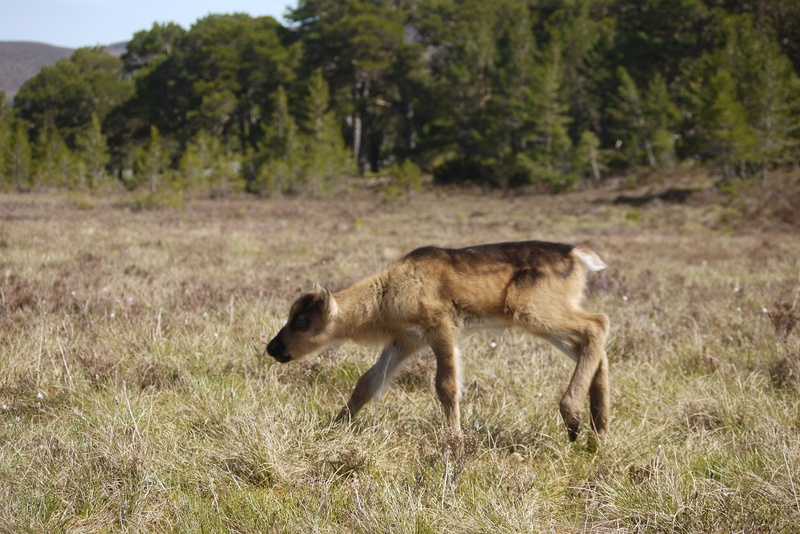 Usually a calf will have grown a small set of antlers in their first summer. While I walk I try and identify the calf’s mother, but it’s not obvious which female is his mother! He darts around the whole group and gets bunted away by several females. Where is his mother? By a process of elimination we identify him as Bond and indeed his mother Ladybird in missing. It is very rare for a four month old calf to be without its mother. He was very small for his age but he was in perfect health. We thought he must have been without his mother’s milk for some time. 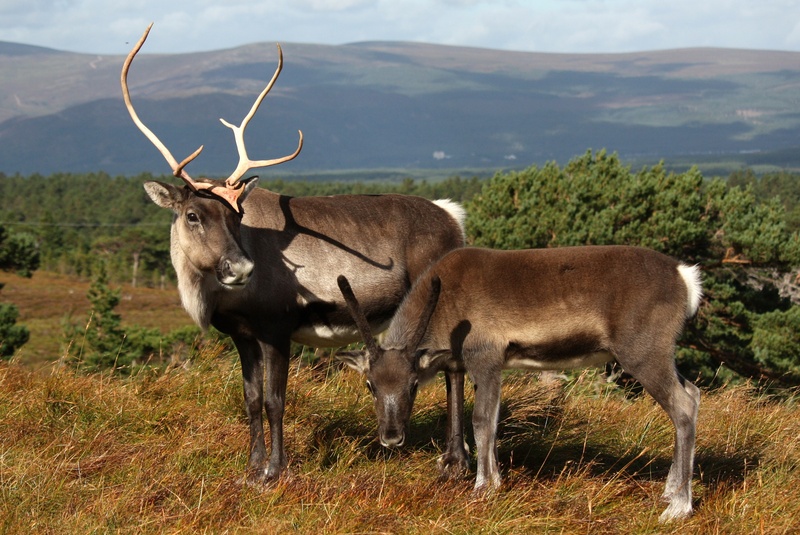 Reindeer calves are extremely hardy and are capable of grazing as soon as a few weeks after birth. Weeks passed and we began to fear the worst about the whereabouts of Ladybird. Until one morning I was out again and spied a group and was relieved to see Ladybird amongst them. I had images like in the movies of long lost relatives reunited but it was not to be. There was no embrace, no high fives. They were often in the same group but would not stick tightly together like other cows and calves. Bond had ‘roughed it’ on his own and that was how it was going to stay. Ladybird’s milk had dried out so their bond was broken. Bond is still smaller than the other calves but makes up for it in gusto. He is often one for the first to kick at the bag of feed, but does so gently. I think to make it on your own you must be stoic and gentle if at times a little pushy. We think around August Bond and Ladybird must have become separated. 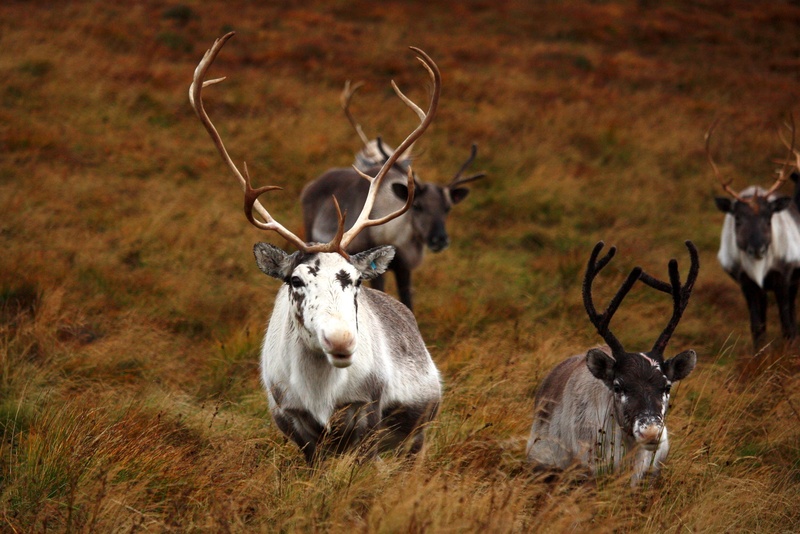 Dogs can sometimes chase our reindeer and can force a group to split. We are looking forward to watching Bond’s progress and Ladybird is doing fine also. 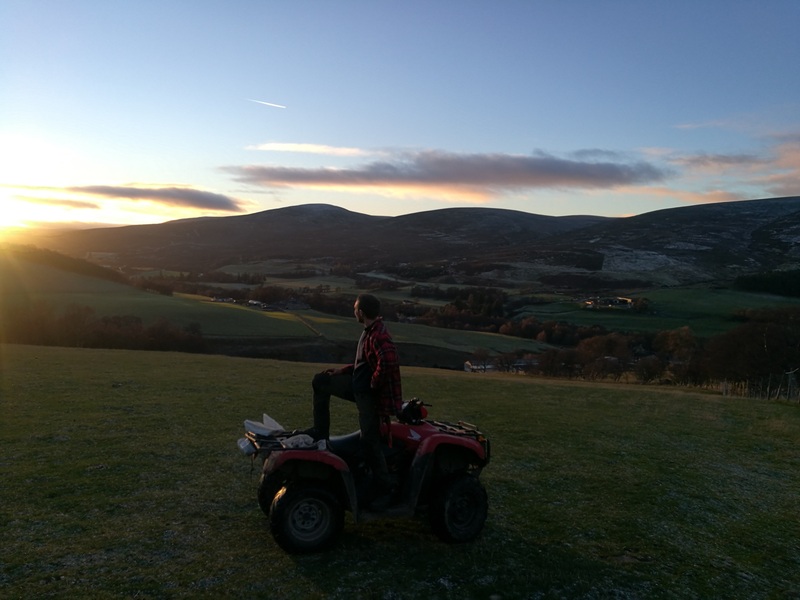 I suspect it’s definitely my turn to write a blog and Chris has been very polite and not pestering me but it’s definitely in the back of my mind so I’ll give you a wee sum up of Christmas. 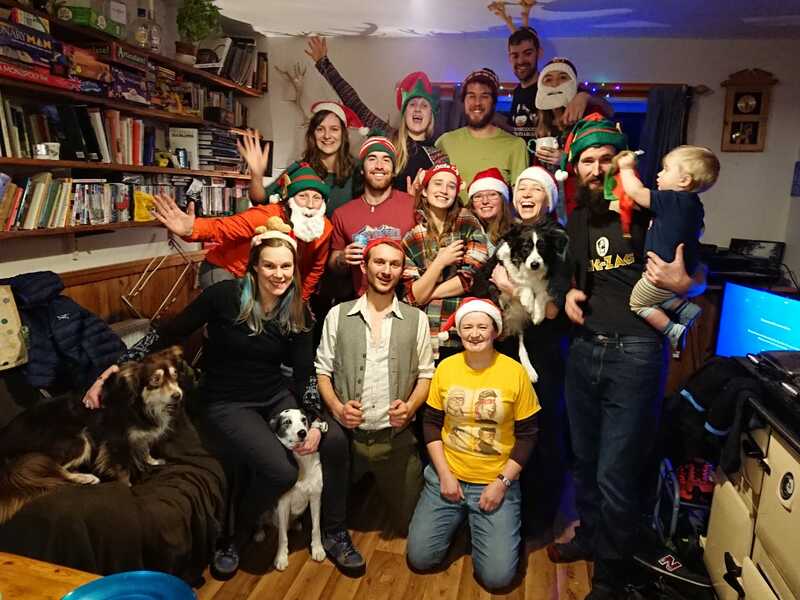 Christmas team 2018… or at least most of it, including dogs. 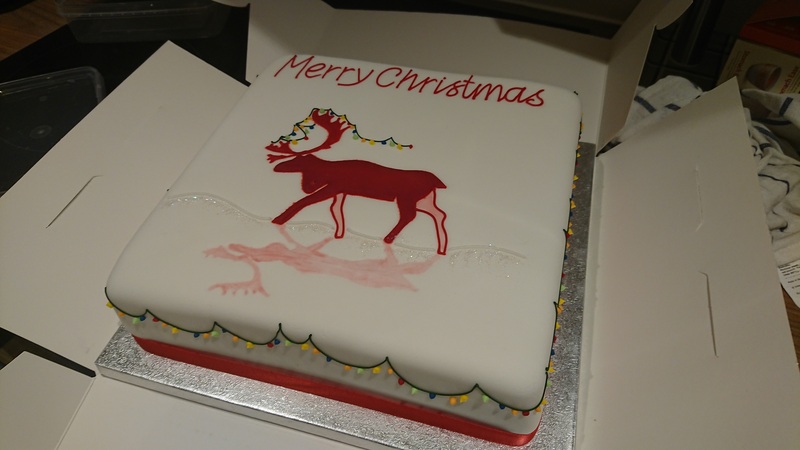 Cake given to us at our event in Essex by one of our lovely adopters… Thanks Michelle! 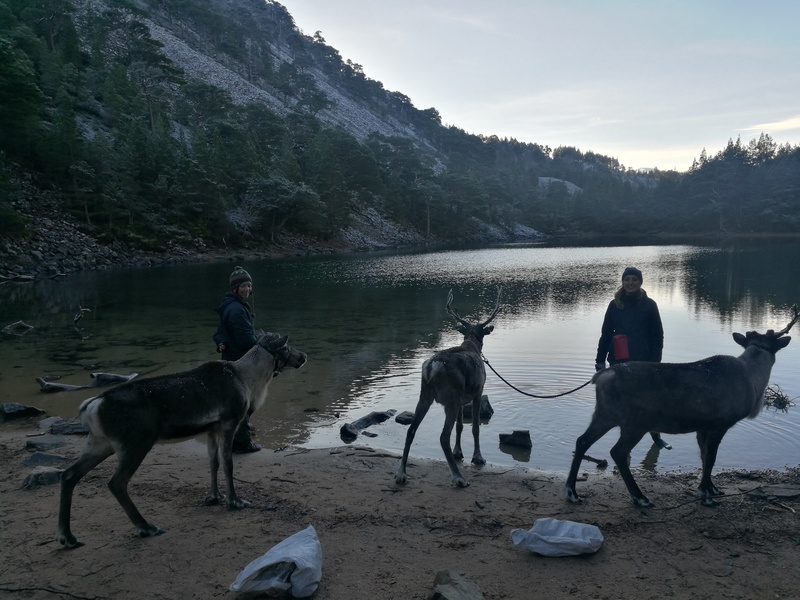 The final days running up to Christmas I dotted back and forth from the farm, doing local events at schools, nurseries and hotels… basically trying to avoid Christmas Fun at the Cairngorm Reindeer Centre. These guys have got it all under control and having organised the events side of Christmas I didn’t need to be involved with Christmas fun as well. I’m clueless when it came to Christmas fun so I was better off keeping out of their hair. Chris finished off Christmas with me doing Christmas Eve and Christmas day round the final events. We also had youngest herders Oscar and Tilly (Colin Delap’s children) join us on Christmas day. 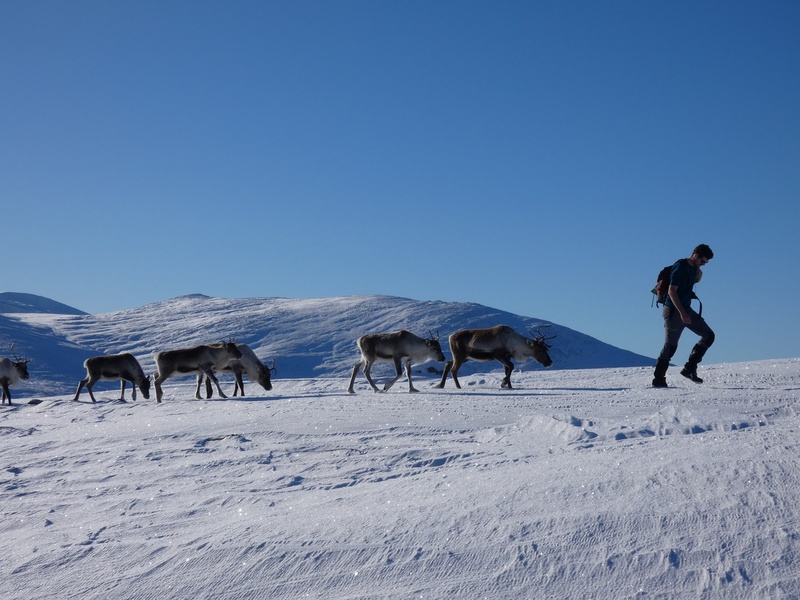 They were leading reindeer and sitting in the sleigh, making sure we were all doing the right jobs of course. It reminds me a lot of when I was a child because myself and Alex would have to join mum and dad on Christmas day going round the local hotels before heading home to celebrate Christmas itself. 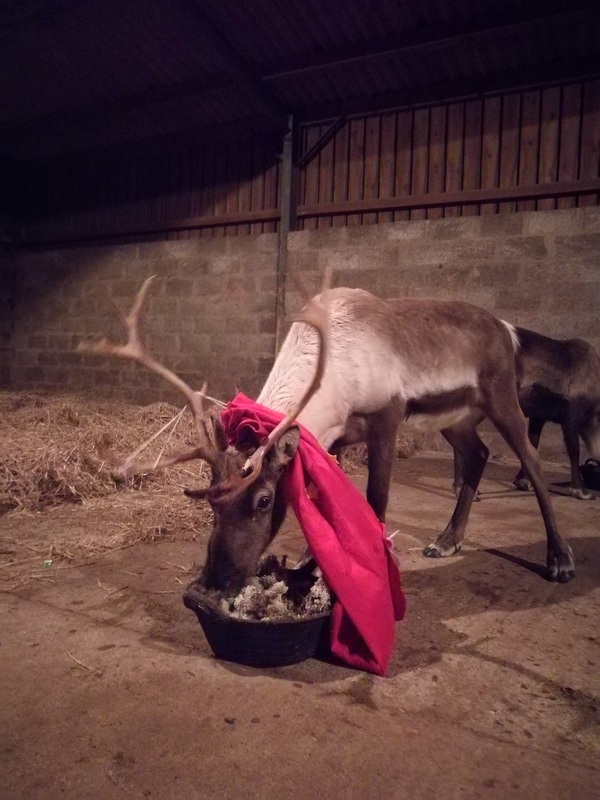 I wouldn’t know Christmas any other way and wouldn’t have it any other way so delighted to see Oscar and Tilly also getting involved because it is such a great way of life working with the reindeer. 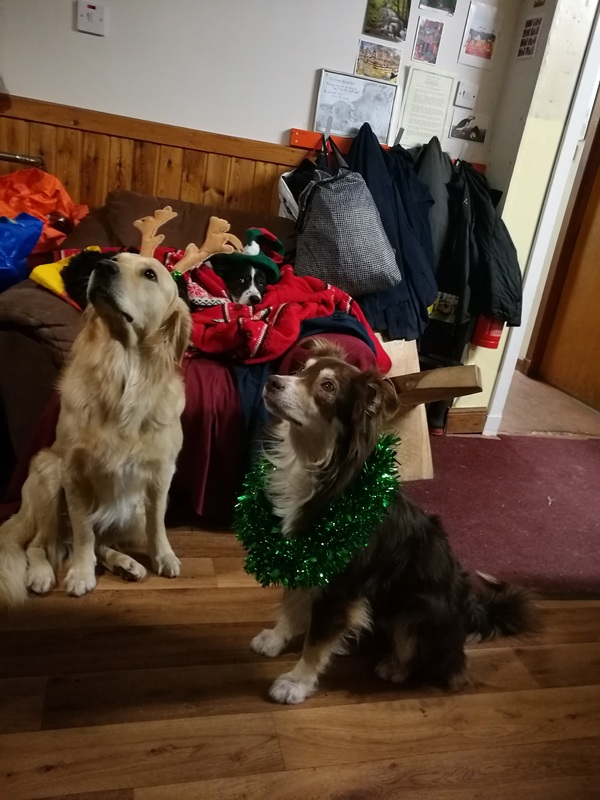 Mini Tilly and Oscar on Christmas day. Start em young! As the Reindeer Centre was shut to the public in January Manouk and I were able to take a couple of weeks off to head off skiing in Austria. We had a great time and Manouk patiently taught me to ski so it was a great success. 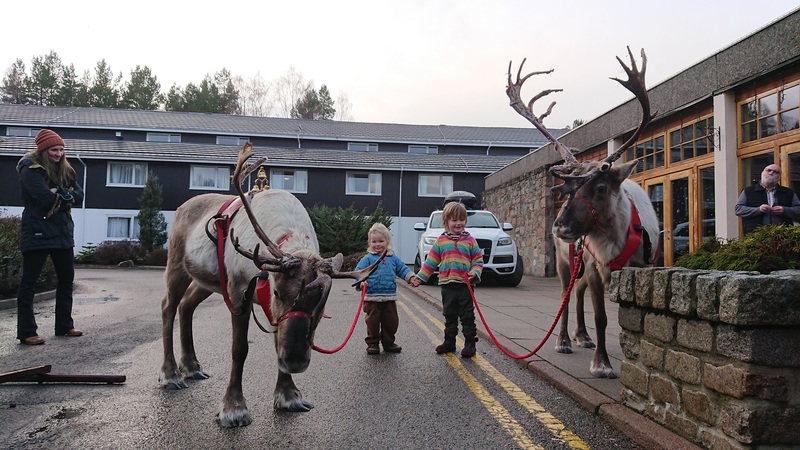 Any time we head away we are always happy to be home as we live in such a fantastic place and love being around the reindeer everyday. We returned home to find winter had finally arrived properly. 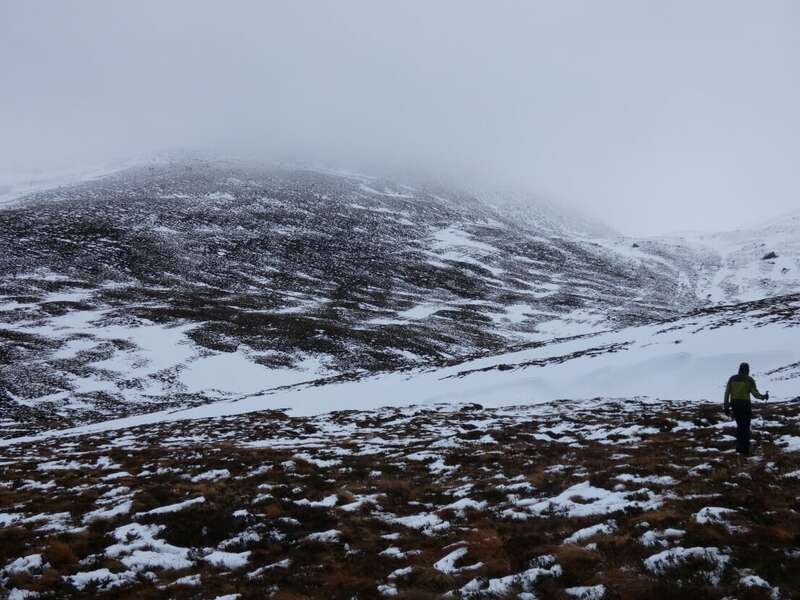 Loch Morlich was frozen, snow everywhere and the temperature regularly dropping to minus 10 overnight for almost a week. 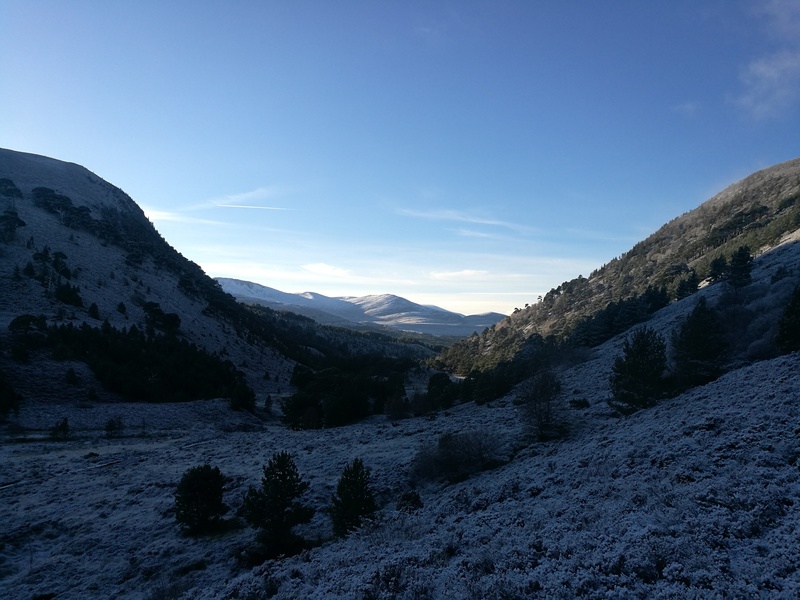 It’s good to be home and we had a stunning first couple of days back here in the Cairngorms so here are a few of my favourite photos. 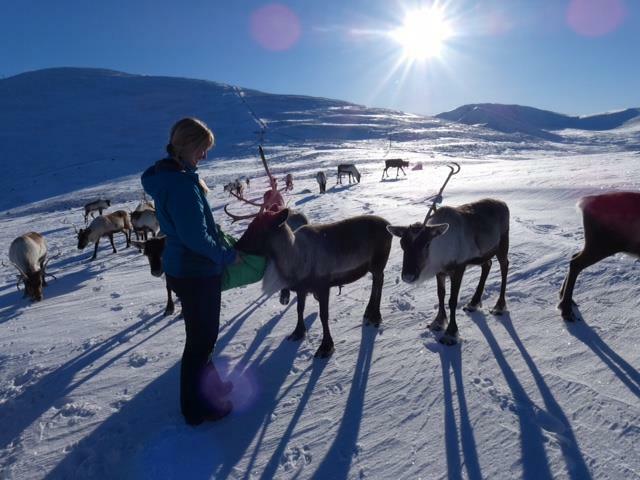 It just so happened that Fiona had also been away skiing for a couple of weeks at the same time, slightly further away from home than us, so we all had a big reunion on a sunny snowy day feeding reindeer together, lovely! 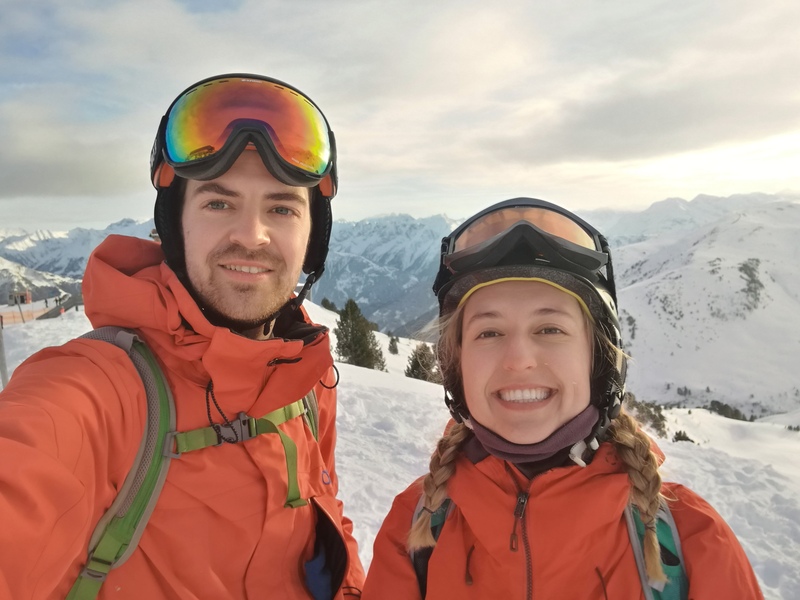 Austrian Ski selfie. 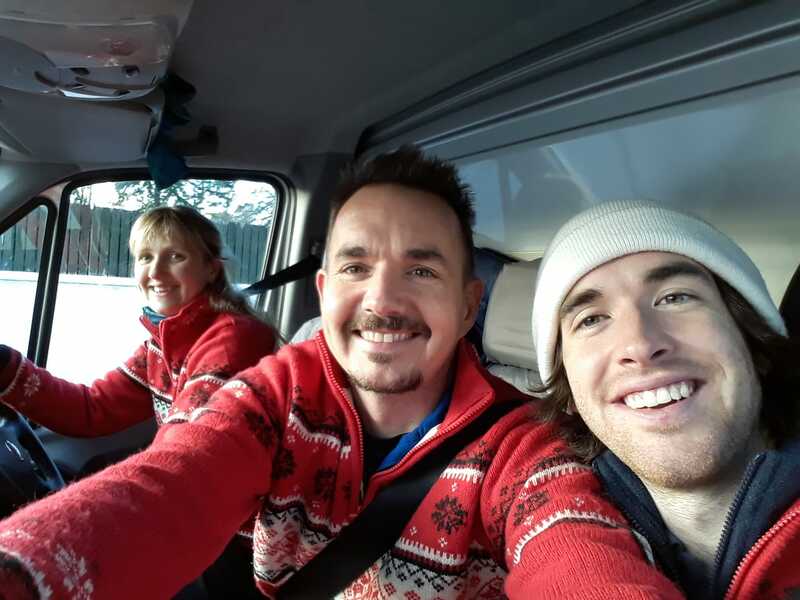 Always wearing our red jackets ready to lead a hill trip at short notice! 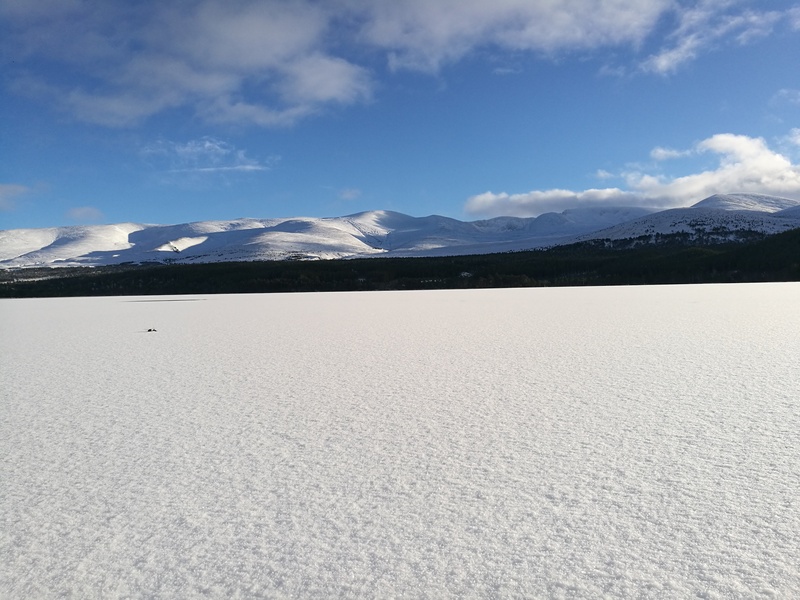 Frozen Loch Morlich, what a sight to arrive home to! 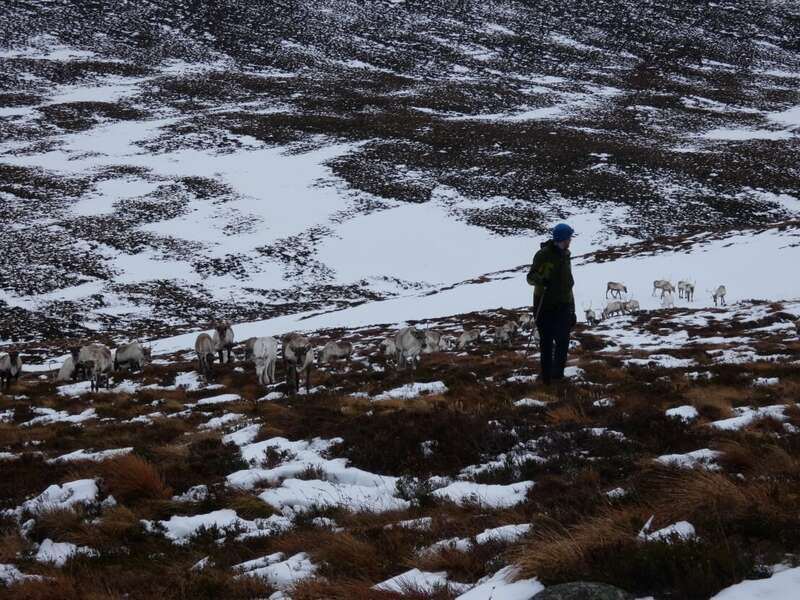 Manouk captured me leading the girls from high up on Windy Ridge down to meet her and Fiona where we would feed them. Ibex and Clouseau leading the way. Chelsea and Pavlova, amongst others, up on a snoy and sunny WIndy Ridge. Fi was delighted to see DIxie as always after a couple of weeks away herself. 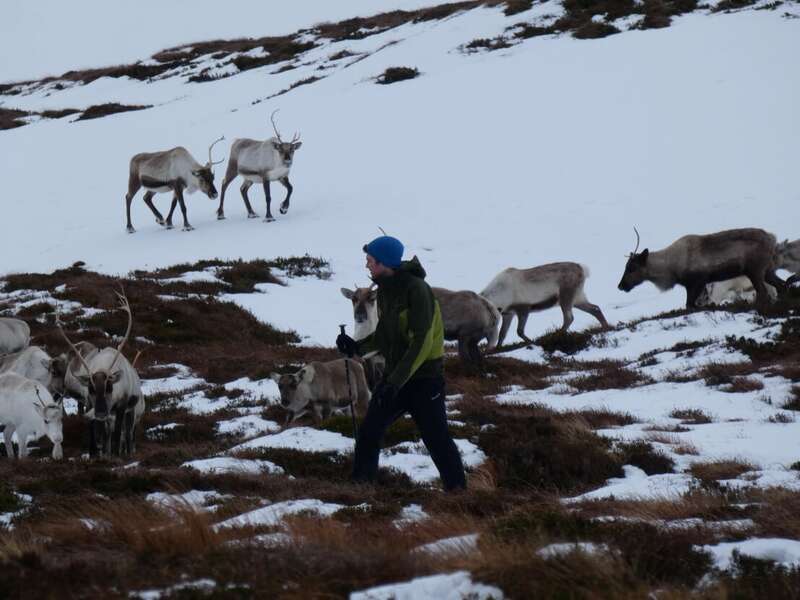 Manouk counting all our girls, thankfully we didn’t forget any names after two weeks sithout seeing any reindeer! 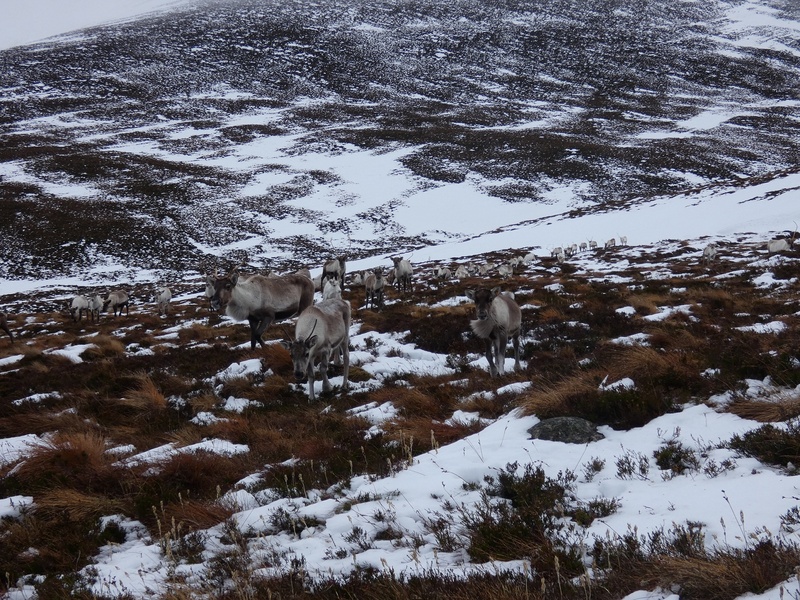 At the moment we do our hill trips with our free ranging females that are roaming around the Cairngorms. As the word free ranging suggests, they are free to go as far as they like. 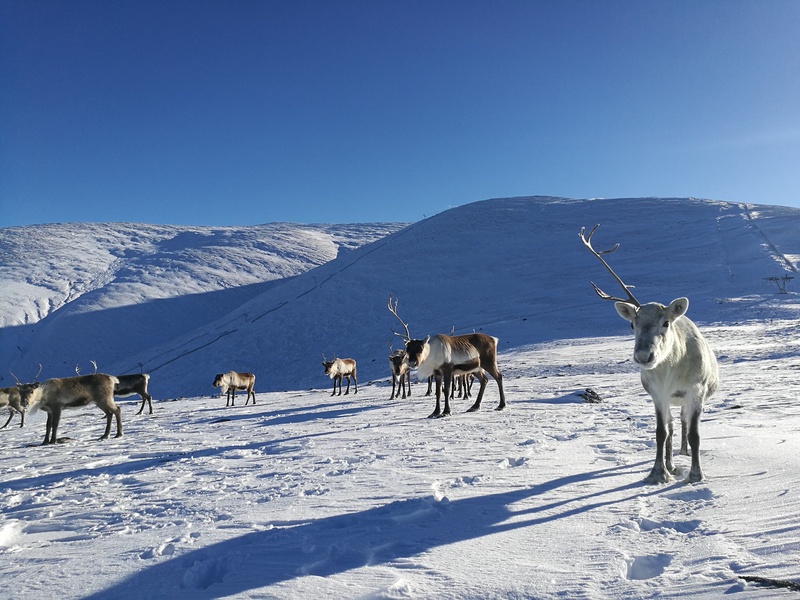 This also means that, if we want to have a trip that doesn’t take up the whole day and that is doable for most people, every morning we have to convince the reindeer to come to an area that is easily accessible. Jaffa leading the girls on a beautiful morning high on the hills. For this reason, we set off first thing in the morning with 2 members of staff to go and find them and to lead them nearer to a carpark. 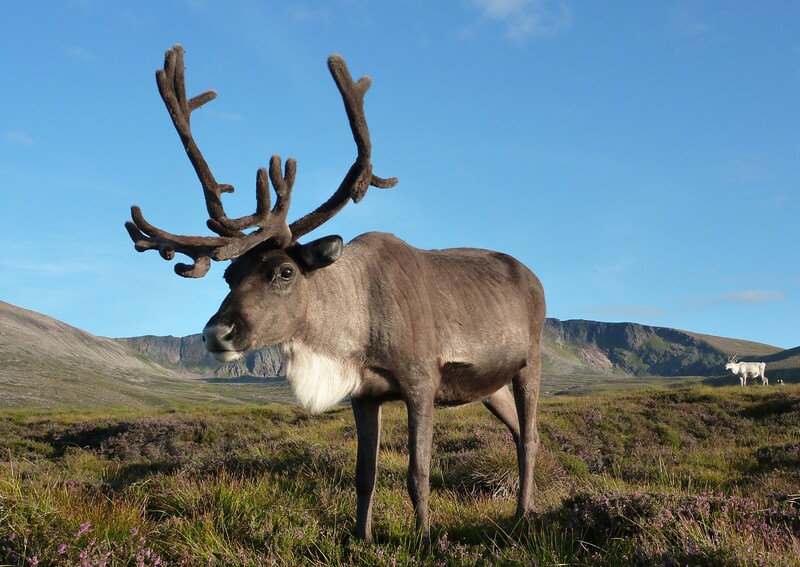 We usually have a rough idea of the area where the reindeer are from the day before. 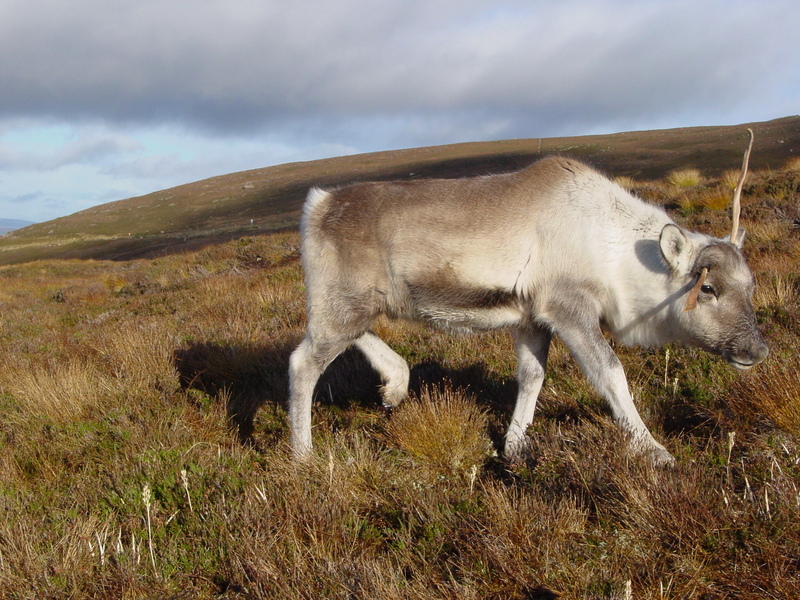 However, reindeer walk at a rapid pace and could move from one place to another in a short timespan, so this often involves some sort of search. 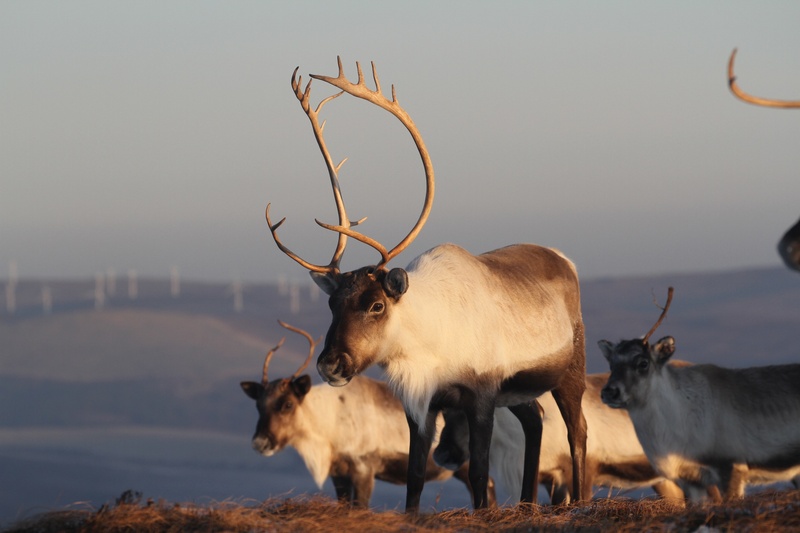 Besides that, they are often quite far out, and as reindeer like to go uphill, so must we in the early morning. When we then finally find the herd, it can take some time to convince them to go down the hill with us. 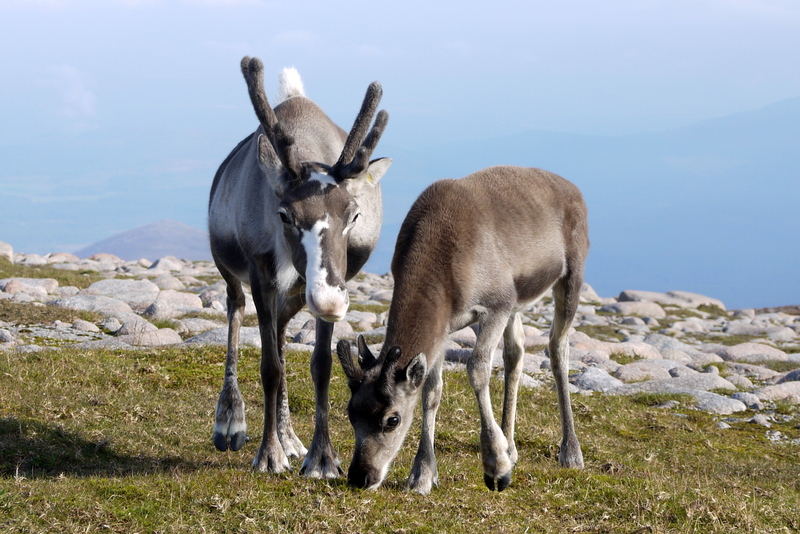 That’s where some reindeer come in very handy: the greedy ones. We will have a wee bag of handfeed, and, knowing if they get to us first they will get a handful, there are always a few that are on their feet right away to follow us. 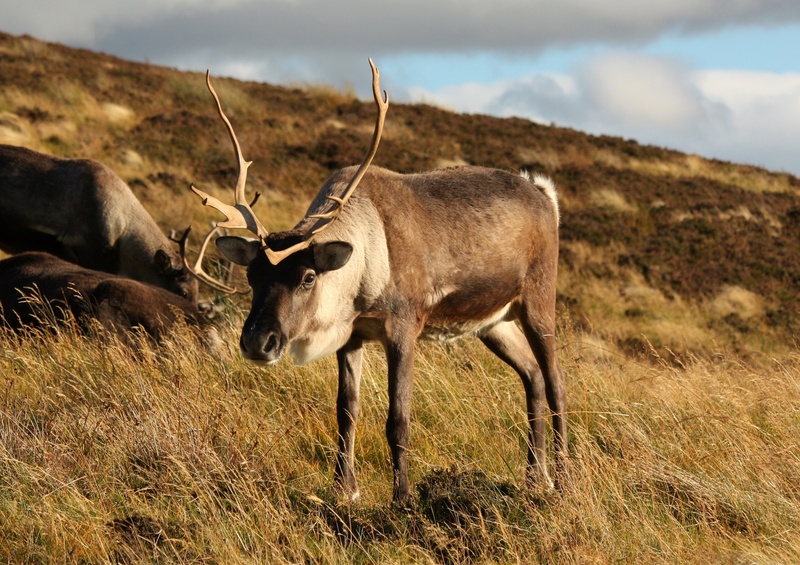 And as the Dutch like to say: ‘if one sheep crosses the dam, the others will follow’ – only it’s reindeer. And they don’t cross a dam, they go down a hill. Anyhow. 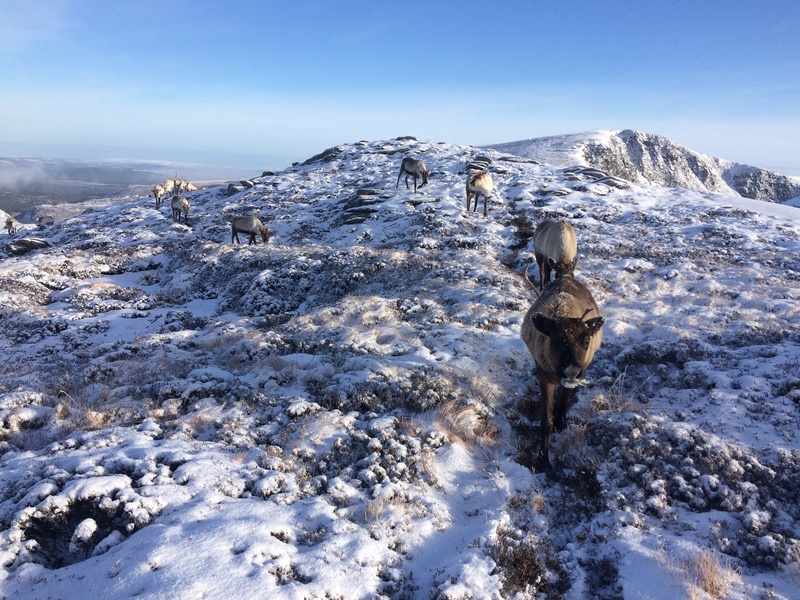 By having a handful of reindeer interested in following us, we are usually able to get the whole herd on their feet and get them to follow us to a nice spot before the 11am visit arrives. 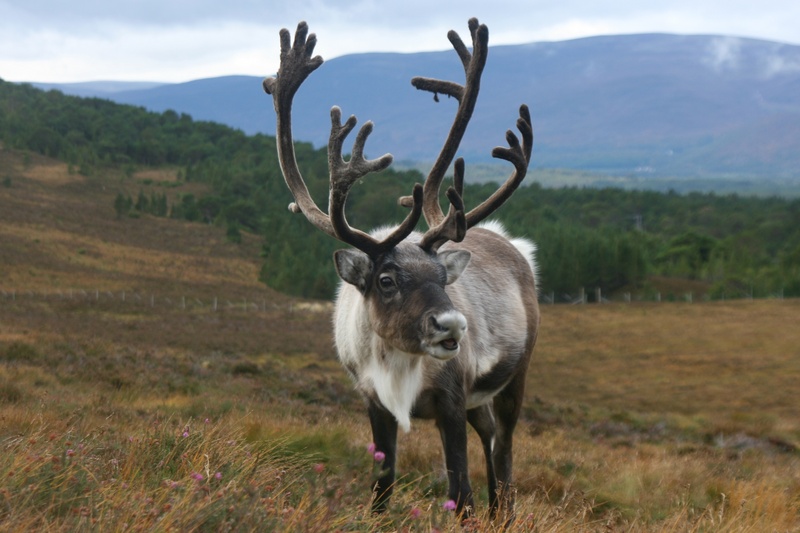 Without greedy reindeer our lives would be a lot more difficult! Thanks Okapi, Fly, Lace, Lulu, Sika, Ibex, Jaffa, and all of the other ones I might have forgotten here! 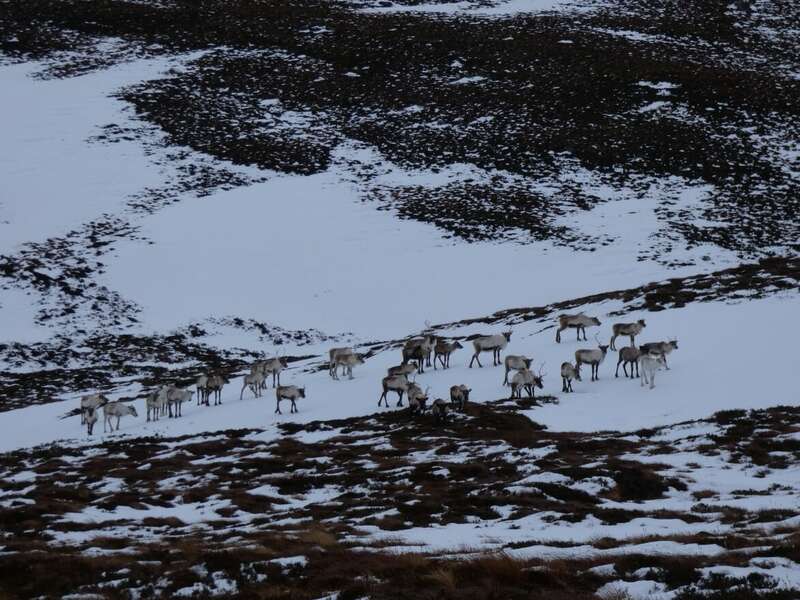 Last week we had a brief thaw of the snow, it’s an awful lot harder to spot the reindeer! 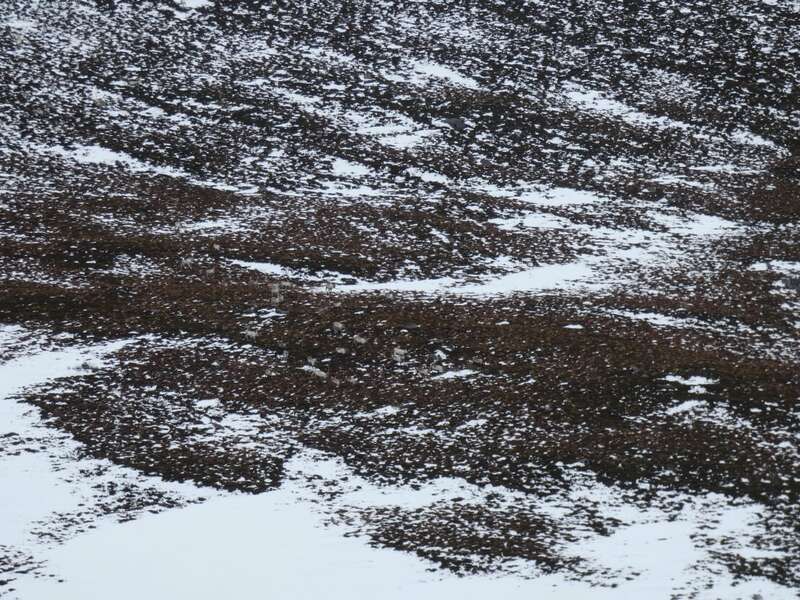 The first few photos show how well they blend in with their surroundings in these conditions. Luckily they don’t hide and come running for food whenever we call them and they can hear us, as politely demonstrate here 😊. 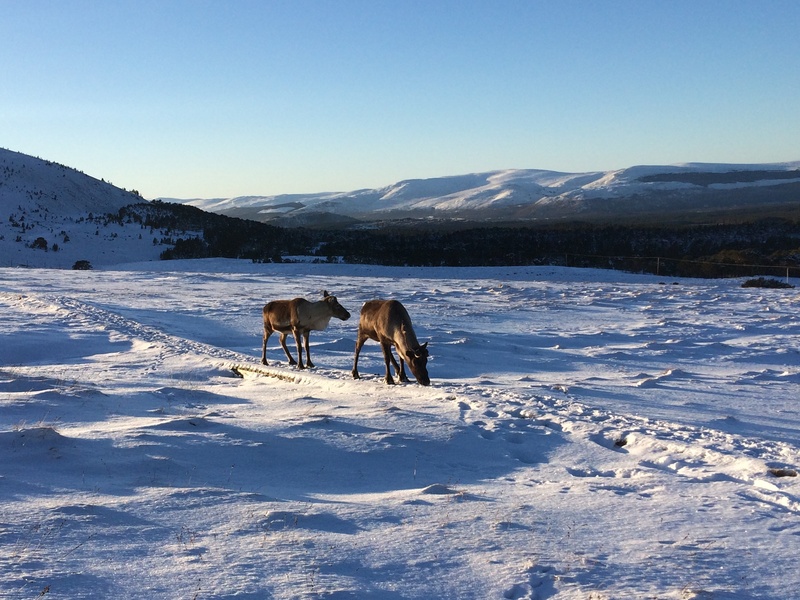 Enjoy some photos of our freeranging herd! 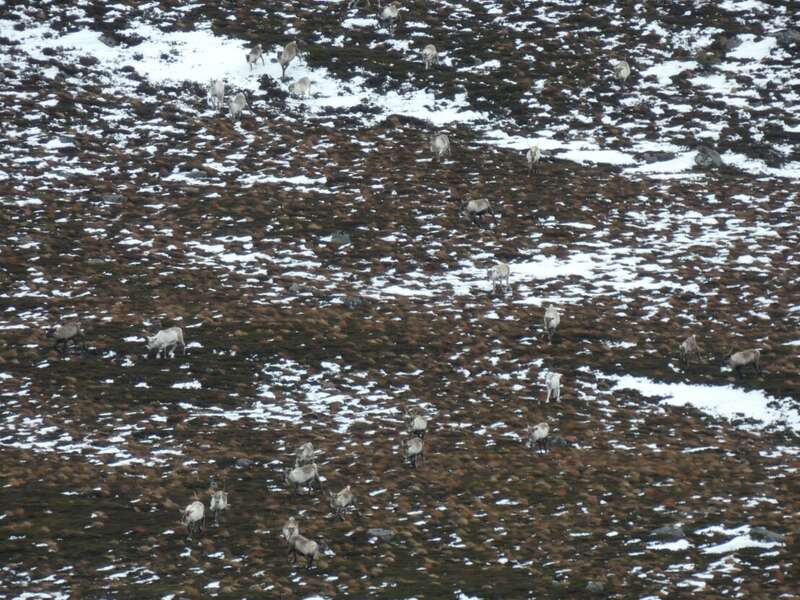 The females kept us waiting last Thursday as they meandered down off the mountains slowly to meet us. Chris leading the likes of Frost, Wapiti, Angua, Fly and Tap in for the final few metres. Fly leading the herd in as she does most days. Bond’s beard blowing beautifully in the breeze. Dave giving the calves their bonus feed. 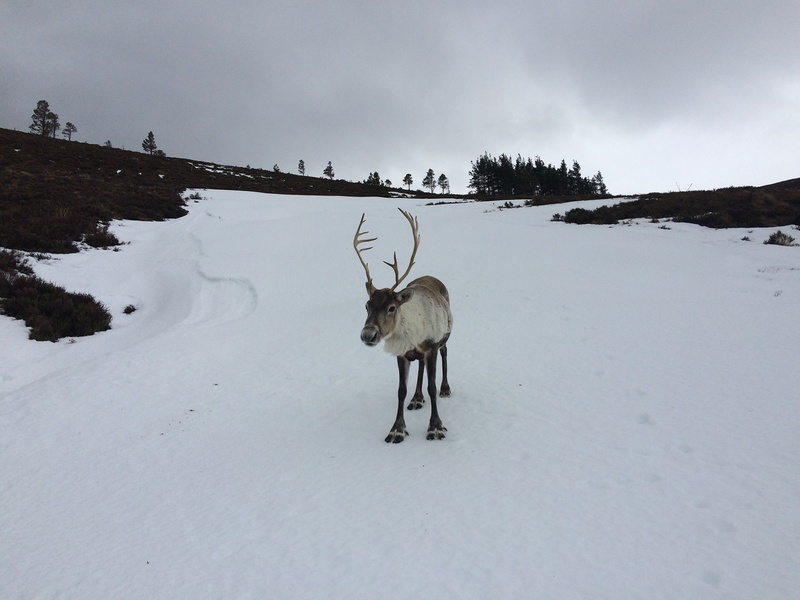 Reindeer can be quite tricky to spot far away on patchy snow!